König von Frankreich (1462-1515). Letter signed ("Louis"). Genua. ¾ S. Qu.-gr.-8vo. Mit Adresse (Faltbrief). 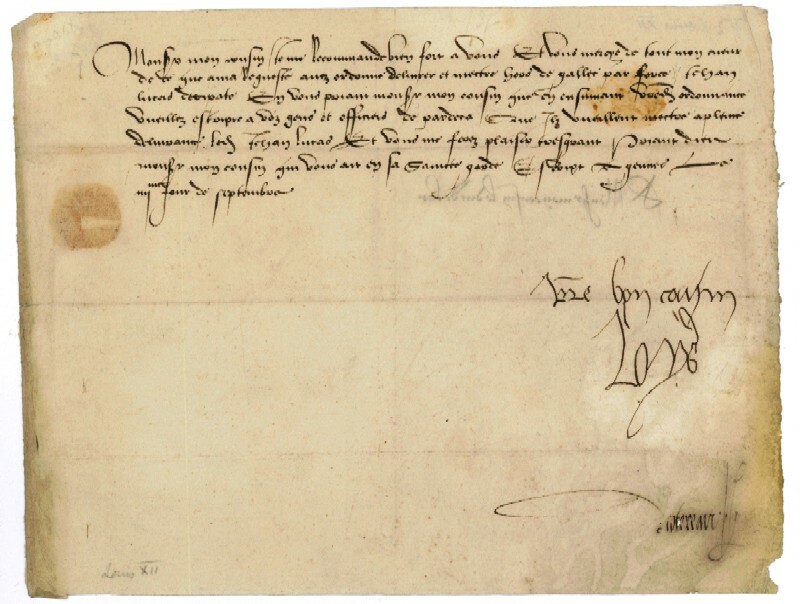 Written as Duc d'Orleans to the Duc de Bar, thanking him and giving him instructions: "[...] delivrer et mettre hors de gallere par force Jean Lucas [...] Vueillez escripre a voz gens et officiers de pardeca Que Ilz vueillent mettre a pleine delivrance led[it] Jehan Lucas Et vous me ferez plaisir tres grant [...]". 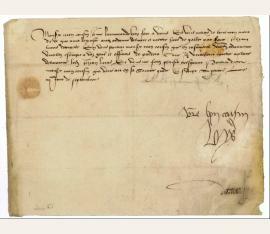 - Counter-signed by Jean Coterau, treasurer to Louis XI, Charles VIII, and Louis XII. One day previously, the army of King Charles VIII of France had crossed Mont Ginèvre and thus started the French army's first Italian campaign for the Kingdom of Naples, marking the beginning of the Italian wars, which were to last until 1559. Charles had detached Louis with an army of 10,000 men which were to support the efforts of the fleet. The French fleet defeated the Neapolitans, and on Sept. 8, four days after the writing of the present letter, the Duke achieved a decisive victory over the Neapolitan troops, which had landed at Rapallo east of Genoa. - Some brownstaining and with insignificant paper defects, some touching the signatures. Traces of a seal; slight edge damage..